Cool Easter Eggs in Minecraft! Minecraft has some pretty cool Easter eggs, but do you know them? While they’re not the eggs that are left by a bunny, these neat Minecraft Easter eggs are sure to give you a smile. In this article, we will be discussing plenty of the little secrets hidden in Minecraft. You may already know some of these Easter eggs if you're an avid player. If you think you know them, let's test your knowledge! If you are certain you won't know any of these, let's get learning! If you want to learn how to speak like a pirate, maybe changing your language setting in Minecraft will help. With 76 languages to choose from, only two are based around comedy. 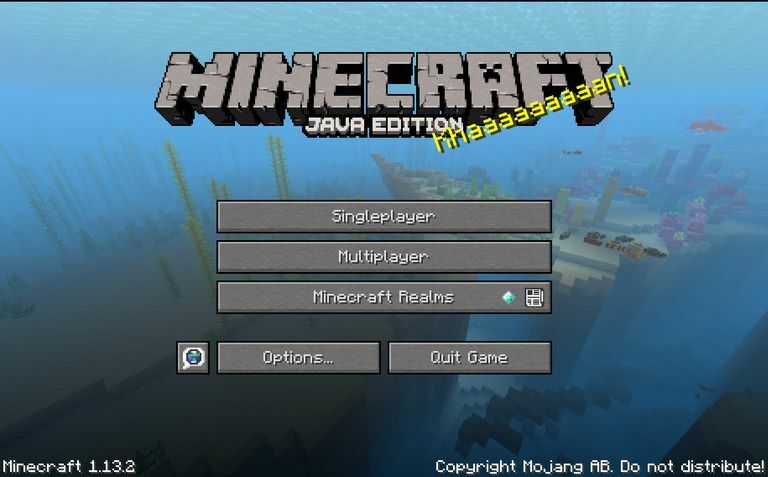 The “Pirate Speak” option in Minecraft’s “Language” setting changes all names of items, mobs, and descriptions in-game. In Pirate Speak, torches are called “Rod o’ Flames”, a Diamond sword is known as the “Bejewelled Cutlass”, and the enchantment Depth Strider is called “Mermaid Legs”. When choosing Pirate Speak as your desired language, you are sure to get some laughs! If you are interested in anything in regards to music, anything technical within audio and visual, or even just want to be fascinated with something you’ve never experienced, the spectrogram of C418’s Disc 11 song will quickly grab your attention. For those who are unfamiliar with what a spectrogram is, a spectrogram is a representation of frequencies of sound in a visual manner. At times, these various representations are completely intended and can show specific images that are designed by the creator. In C418’s Disc 11 spectrogram, you may notice a very familiar face. The face that you will specifically notice is Steve’s! With a large box that resembles his face with eyes and a nose, it’s very clear it’s him! On top of seeing Steve’s face, you will see the numbers “1241” to the right. While it is unclear what those numbers mean and represent, it is fairly obvious the numbers are written in the normal C418 type of font. Maybe these numbers are representative of something that may come in the future, but for now, we do not know much in regards to them. As mentioned in the article speaking about who Jeb is, we spoke about an easter egg in Minecraft that was very colorful, nonetheless. Naming a Sheep in Minecraft “jeb_” with an Anvil and a Nametag will result in the sheep pulsing all of the colors of the rainbow. This sheep was added in the 1.7.4 update of Minecraft. Whatever color the Sheep’s Wool is before applying the Nametag is the color of Wool that the Sheep will drop upon shearing. The Rainbow Sheep has many names but is also commonly referred to as The Jeb Sheep or Disco Sheep. Like The Rainbow Sheep, making a mob upside down follows the same pattern. Naming a mob in Minecraft either “Dinnerbone” or “Grummm” will cause the mob to flip upside down and cause it to seem as if it is sliding across the ground. To name the mob either “Dinnerbone” or “Grummm”, a player must use a Nametag and an Anvil. This small update is in reference to Dinnerbone’s Twitter avatar. This nod was added by Notch himself and is fairly neat to see! Reminding everyone of the video game’s creator, this splash text Easter egg is an extremely cool way to celebrate his day of birth. When a Rabbit is named “Toast” with a Nametag and an Anvil, the Rabbit named’s skin will change to a black and white texture. Naming the Rabbit “Toast” will not have any behavioral changes and is purely for cosmetic effect. Many players were confused with Toast’s addition to the game, wondering what the name was a reference to. In 2014, Reddit user “xyzen420” made a post to the /r/minecraftsuggestions subreddit in regards to his girlfriend’s missing rabbit named “Toast”. Asking Mojang to consider putting his girlfriend’s rabbit into the game, they accepted. Toast’s addition to Minecraft was very heartwarming and very special for a select two people. To anybody who's ever played Age of Empires II: The Age of Kings, a potentially noticeable reference has made its way into Minecraft. The Evoker, Minecraft's enigma of a mob, has a very specific reference to Priests from the game mentioned previously. In Age of Empires II: The Age of Kings, Priest units would yell a sound along the lines of "WOLOLO!" while converting enemies to their side, changing their color and team preference. Evokers have followed suit, screaming the exact "WOLOLO!" from Age of Empires II: The Age of Kings any time a blue sheep is near. When the Evokers make their chant, the Sheep's color will swap to red. As Age of Empires II: The Age of Kings was developed by Microsoft Studio's "Ensemble Studios", the sound was allowed into Minecraft as Mojang was purchased by Microsoft. There are plenty of interesting Easter eggs that have been introduced into Minecraft over the years of development. Hopefully, as more time progresses, only more will be added. A PC Game Demo Is Still Available for This RTS Gem. Download Now!